This image is a small portion of the Lafrery map of 1566. It appeared in Un Angolo di Napoli (A Corner of Naples) by Benedetto Croce, published in Bari in 1912 by Giuseppe Laterza & Sons. This is kind of tricky, even if you know Naples and are familiar with the modern layout of the city. The image is presented in the orientation of the original Laffrery map; that is, north is not directly at the top but rather at the "one o'clock" position. Thus, the one-to-seven o'clock street is today's via San Sebastiano at the top, changing to via Santa Chiara at the intersection and proceeding south as it runs by the monastery wall. That street was where the old pre-Spanish city wall ran (meaning before the mid-1500s). Once you passed the wall, you were in the old Greco-Roman city, today called the Historic Center. The other street, running west (ten o'clock) to east is today's via Benedetto Croce. At that intersection, the belfry on the corner is still quite prominent today. That entire street, although it changes names along its considerable length is referred to popularly as "Spaccanapoli," (Naples splitter). Obviously, a few things have changed in the last 450 years. Number 8 is an interesting example. It is labeled 'Monastery of S. Sebastiano'. Indeed, it was one of the oldest paleo-Christian buildings in Naples. The entrance was on that street. In the 1700s, however, the Bourbons converted the market place behind it into an important square, known as Piazza Dante today. The old monastery became a music conservatory for a few years in the early 1800s, but is now a high school with the entrance on Piazza Dante. The old entrance is now the back door. If you move just up the street and turn the corner to the right onto the street named via dei Tribunali today, you find number 9, the church and monastery of S. Pietro a Maiella. The church is still a church. The monastery is the current music conservatory. 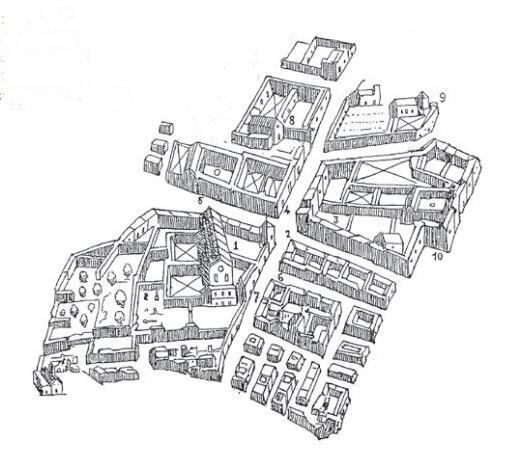 In using this map, Croce might have chosen to include some other structures but did not because they were really not part of the crossroads, the "corner" of Naples he was writing about. One would be the church of Gesù Nuovo (a very short distance to the west - left - of #5); the large empty white space in the upper left quadrant of the image is today's large Piazza del Gesù Nuovo, which existed at the time the map was made, but without the imposing spire in the middle, erected in 1750. And if you turn and walk back to east on that road, you find, at #10, the church of San Domenico. That building today forms the western side of the large Piazza di San Domenico Maggiore where the large church of that name as well as another tall votive spire are found. Lesser known today are the names that appear at #6 and #7; Berardino Rota (1508-1575) was a wealthy nobleman and man of letters, whose home was somewhat the center of activities of the Neapolitan literati of the day; Antonio Epicuro is referenced in sources as a "humanist from the Abruzzi" who at a certain point moved south to Naples. He wrote in both Latin and Neapolitan and his plays are important in the history of what is called pastoral drama. Croce knew this area extremely well. He would, some centuries later, spend most of life living and working at #3, today the Italian Institute for Historical Studies.